Is the limit for appreciated securities 30% or 20%? Notes on tax efficient ways to give money to charity. Funds remaining in IRA accounts at death are good candidates to leave to charity, because if left to heirs a substantial fraction of these funds will be lost to taxes. Also 'directed beneficiary' information for bypassing probate. Congress has now started to mess around with, and of course greatly complicate notes Ed Slott, IRA 'minimum withdrawal' rules. These rules are important because they control when IRA assets get taxed. WSJ reports a bill and been passed and signed that suspends minimum IRA (& 401k) withdrawals for the years 2009 only. Now that IRA taxation is no longer a fixed compact, I suppose we need to plan on congress increasing IRA withdrawal rates in future whenever there's a need for more revenue. Under current law the federal estate tax exemption is scheduled to decrease to $1,000,000 on January 1, 2013 and the fed tax rate to increase from 35% to 55%! The idiotic (federal) estate tax yo-yo continues. The newly passed two year extension of Bush tax cuts reinstates the estate tax in 2011 and 2012 with these numbers: maximum rate of 35% with a $5 million exemption per person. (This compares to 0% tax in 2010, and in 2009 a 45% maximum rate with $3.5 million exclusion.) The 35%/5 million rates sunset Dec 31, 2012. Beginning in 2013, there will be a $1 million per person exclusion with a 55% estate and gift tax rate unless further legislation is enacted. For 2012, both the estate tax and lifetime gift tax exemption is $5,120,000 per person and $10,240,000 per couple with a 35% top tax rate. Beginning in 2013, however, unless further legislation is enacted, the exemptions will drop to $1 million per person ($2 million per couple) and have an effective top tax rate of 55%. -- States have their own estate taxes. Approximately 17 states plus the District of Columbia impose an estate tax. These state estate taxes are separate from the federal estate tax and they all have exemptions that are lower than the $5 million federal exemption. House passed an estate tax bill establishing a steady rate and threshold. The numbers are exactly the numbers Obama called for in the campaign: threshold of 3.5 million (7 million married couple) with a federal estate tax above the threshold of 45%. The estate tax goes to zero in three weeks if the Senate does nothing. Not a single Republican voted for the bill. I guess they like the estate tax going up and down like a yo-yo, idiots. Prior to the election and (really subject to change) --- "Obama's plan calls for keeping the estate tax exclusion at $3.5 million (2009 level) permanently, as well as for maintaining the 45 percent tax rate." (NYT) Current law has the estate tax in 2011 returning to 2001 levels. This is an exclusion of only $675,000 and a tax rate 55 percent, so if there is no legislation this is where estate taxes are going. being part of your estate, so it may help with estate taxes too. on the inherited IRA money. by Worker, Retiree, and Employer Recovery Act of 2008.
to help the economy from 2008 financial crash. Qualified Charitable Distributions were reinstated by congress for deductions in 2014 only in dec 2014 (with expiration 12/31/14)! It allowed up to 100k direct transfer from shielded accounts, and this withdrawal can be used to meet IRS minimum distribution requirements. A direct IRA to charity contribution will not appear on your AGI (adjusted gross income). Tiaa points out that this is an advantage for people living in states that do not allow charitable deductions (like MA). Since I live in MA and need to take minimum distributions, doing charity this way would save about 5% on MA taxes for the amount donated. However, this provision is loaded with restrictions. A big kicker (same as previous years) is that the contribution cannot be made to donor advised fund, it must go directly to a public charity. Another big restriction Tiaa-Cref points out is 403(b) plans don't qualify, though they suggest a work around is to roll over funds from a 403(b) to an IRA, and then make the charitable contribution from the IRA. Qualified Charitable Distributions have not been reinstated for charity contributions made in 2015 as of Sept 25, 2015. As of April 2015, the QCD rules have lapsed again. and there is no guarantee that Congress will reinstate them retroactive to the beginning of 2015. This same situation has presented a quandary over the last few years as taxpayers have had to wait until the end of the year to find out if their QCDs would reduce taxable income. So what’s a person to do in 2015? What below is called the Charitable IRA Rollover is the same thing as qualified charitable distribution (QCDs). This is all about using a charity transfer to meet the IRA RMD. It began in 2006 and expired at end of 2013, but every year for seven years it has been extended retroactively. Ed Slott says you can take your chances that it will be extended for 2014, and the worse that would happen is that it needs to be reported as income against which you take a charitable deduction. There is a limit on the amount that can be transferred from an IRA to a charity, at least to satisfy RMD, and that limit is 100k. An Ed Slott video seems to imply that the 100k limit only applies to meeting the RMD. QCD applied in 2013, however, there is the caveat that it (or some of it) does not apply to donor advised charities. I don't have any person experience with this provision. I was thinking I did in 2013, but when I checked my records my RMD from IRA was a cash withdrawal. I gave 50k to to my Fid donor advised charity in 2013, but this money did not come from an IRA account. It was appreciated securities that came from a taxable account. This of course that is the reason it did not show up on my income tax and increase the AGI (adjusted gross income). As long as the source of the money going to charity is from a taxable account, I doubt the 100k (or ANY) limit applies, after all you are giving away after-tax money. The provision for qualified charitable distributions (QCDs), which allows IRA and inherited IRA owners 70 1/2 or older to transfer portions of their accounts to qualifying charities tax-free while satisfying all or a portion of their RMDs (required minimum distributions), expired at the end of 2013. Although widely expected to be reinstated by Congress at some point there is no guarantee that will actually happen. That’s especially true since this is an election year. Each time Congress has brought back the QCD provision in the past, they have made it retroactive to the date it previously expired. As a result, assuming you had followed the rules for QCDs during the periods of time the provision was expired, your distributions eventually were treated as valid QCDs. While there is absolutely no guarantee that if Congress brings back the QCD provision again, it will once again do so retroactively, there’s more than a reasonable chance they’ll do so. At worst, you’ll have to claim the distribution as income on your return and claim the contribution to charity as an itemized deduction. (update 4/12/13) Surprise! The Charitable IRA Rollover is back again for 2013. I only learned about this in April 2013 from a theater company mailing with a story "Charitable IRA rollover is back for 2013" confirmed by Fidelity. However, it comes with a big caveat, doesn't apply to 'donor advised charities', even though Fid and Van tell us they are real charities, the law specifically excludes them. How useful is Charitable IRA rollover? Just started to think about this, but to first order I don't see any major (fed) advantage here, nor did a Forbes article see any. Plus there's a lot of hassle and gotches. The biggest one is that the money can't go to a donor advised charity. That means each charity 'transfer' must be done separately probably requiring calls and emails to both the charity and IRA provider. (However, after this is done once, it may not be that hard 2nd time. I suspect there are also gift thresholds here too.) Another big issue is this is IRA only. It does not apply to 403(b) accounts (I confirmed this with a tel call to Tiaa-Cref). It does appear though that in states like MA with almost no deductions, that the portion of the IRA withdrawal going to charity this way avoids being taxed by the state (as income). In MA this would be a 5.25% savings. To a first order [donating to charity + itemized charity deduction] is from a tax viewpoint the same as using charitable IRA rollovers. In the first case the portion of the withdrawal that will go to charity is added to AGI and then subtracted off (dollar for dollar) to form taxable income, and in the second case of the charity rollover withdrawal the charity funds never appears as income with the result that taxable income is the exactly the same in both cases. For example, suppose total RMD [from IRA and 403(b)] is 85k and 40k is to be donated to charity (via donor advised fund). In the standard treatment form 1040 will show 85k RMDs added to other income to form AGI (adjusted gross income), then as long as total charity deductions stay below 30% of AGI, 40k to charity is included as an itemized deductions and subtracted off to form 'Taxable Income'. In other words taxable withdrawals combined with a large charity itemized deduction results in only the difference [45k = 85k - 40k] being taxed. If the 40k were to be given to charities via (multiple) charitable rollovers and a 45k withdrawal taken to meet the 85k RMD, then taxable income is up 45k in both cases. There is a difference in AGI, it is 40k higher in the standard treatment. Forbes points to some 2nd order advantages. Because the charitable rollover keeps AGI down, Medicare premiums which are AGI triggered, might be lower. The biggest advantage I can see is a charitable IRA rollover is it provides some investment flexibility. Rather than just funding charity donations through appreciated securities (via donor advised fund) money can come from any IRA investment (like high yield bonds and RE). Not a huge advantage, but if this is right it would save 525 dollars in MA taxes for every 10k transferred from IRA to charity to meet the IRA required minimum withdrawal. (update 12/12/11) Another extension of the over age 70 1/2, 100k 'IRA charitable rollover' was included in financial crises legislation extending it through Dec 31, 2011, where again it is scheduled to sunset. But note an important caveat is that the IRA charitable rollover cannot go to (or through) a 'donor advised fund'! (update 6/6/10) Unfortunately the 'IRA charitable rollover' (the nice IRA tax avoidance loophole described below) has expired. It existed for four years (2006 to 2009). It was extended in 2007, but expired at the end of 2009. IRS Publication 590 (2009), Individual Retirement Arrangements (IRAs), "Qualified charitable distributions are scheduled to expire and will not be available for 2010"
Pension Protection Act of 2006 allows people over 70.5 to transfer (rollover) up to 100k annually from an IRA while living to charity (starts 2006, expires Dec 2007(update --- extended through 2009 by bailout bill), to a max of 100k/yr). These charity deduction withdrawals are not taxed and contribute to meeting the minimum IRA distribution requirements. With direct IRA to charity transfer all of the above limits (traps) are avoided . It makes larger charity gifts (while alive) more attractive (from Wall St Journal 12/11/06). Here is a discussion of all this in an academic paper. (Update 1/29/07) Charities says this method of give has proven popular (Harvard reports 150 of these gifts in 2006). Not surprisingly charities are lobbying to make this IRA direct to charity rollover permanent. (update 10/08) Charity giving from an IRA can reduce your minimum IRA withdrawal and 1040 'adjusted gross income'. Example, your IRA minimum withdrawal is 12k, but you want to give 10k to charity. If money goes direct from IRA to charity it counts against you minimum withdrawal, so you only need withdraw 2k from IRA, and only 2k will be added go gross income on your income tax form. At fund raising time PBS has on lots of self-promoting speaker/gurus, and today's off the wall talk was on the horror of IRA taxes at death (true) and what you can do to minimize it. For what it's worth here briefly were his three points (I have not checked any of this, so it's probably only half right, and be prepared for lots of complications, restrictions and gotchas.) Slott has a useful online IRA Help forum where he posts. money to pay them.) Another way to Rothify your IRA? get a 4M exception, but not if spouses leave their estates to each other. Blowing a 2M exception is big bucks. When I heard the PBS IRA pitch again, I found out the IRA pitchman is named Ed Slott. While he is definitely a showman, it turns out he is a CPA and a legitimate expert on IRA's. I've noticed recently that the regular Retirement column in the Wall Street Journal uses him as an expert for IRA questions. I'm reading his book now, Parlay Your IRA into a Family Fortune. While it has showman aspects to it, there's also a lot of good IRA information in this book that I have not seen anywhere else, and more importantly what seems like good advice on minimizing IRA taxes. While Slott (badly) oversells the 'IRA stretch' concept, it does appear to be a valuable technique for reducing IRA taxes in the case where IRA funds at death are to be inherited by younger members of the family. It requires that an IRA be properly set up and properly handled by the beneficiaries. The trick is that younger beneficiaries are able to reduce the required minimum payout of the IRA to 2% to 4% a year because of their much longer expected lifetimes. This can allow the IRA to grow for decades more after death of the owner, and by delaying the payment of most of the IRA taxes until decades after death it can greatly reduce the effective tax the beneficiaries have to pay on the inherited IRA money. "This is both a very good and very bad book. Slott is a CPA and his bio indicates that he specializes in IRA law and estate planning. The retirement column in the Wall St. Journal uses him as an IRA expert. If you've seen Slott on PBS, you know he is also a pitchman and showman. This book is a mixture of expert IRA info and advice and wild overselling. This book is full of IRA information and good IRA advice presented in a very readable manner. I made dozens of notes in the front cover while reading this book. An excellent IRA reference. And I think the book does a service by pointing out that the IRA code has (sort of) a loophole that allows the 'effective' taxes paid on the IRA to be greatly reduced if the IRA is passed on to younger family members who should (Slott recommends) only take out the minimum annually over their lifetimes. Slott calls this the 'stretch' IRA. Your IRA can grow into a FAMILY FORTUNE, he screams, with pages of tables showing a 100 thousand IRA growing to millions (in one case to nearly 300 million if left to grow into well into the 21 century!). Nonsense, what about the time value of money? Slott never heard of it (or pretends he never heard of it). The reality, of course, is that if your income tax rate is, say, 33% then when you withdraw IRA funds you lose 1/3rd of it to taxes. The best that even a perfect tax strategy can do is recover this 1/3rd. Nice, but hardly a fortune. Slott provides a useful check list of features an IRA contract should have. You would think that maybe he would read the IRA contracts of top IRA providers (like Fidelity, Vanguard) and tell us how they stack up? Nope, that's our job, not his. Convert to a Roth IRA and your money will grow TAX FREE he screams. Slott's very positive on Roth IRA's, too positive. I worked through a Roth conversion example and find that the extra shielding that a Roth IRA allows can boost your after-tax returns a little. (Calculation details are in 'Roth Primer' section of the 'Charity' essay on my home page.) I calculate in a 6% market environment that Roth IRA will yield 6% vs an after tax yield for a traditional IRA of approx 5.4%, or an extra 0.6%/yr investment gain. However, there can be a serious downside to doing a Roth conversion that Slott doesn't mention. A large Roth conversion will likely be taxed at a much higher incremental income tax rate than normal minimum withdrawals, and since Roth has only a tiny yield advantage over a traditional IRA it could easily take a decade or more just to get even." The distribution of IRA assets is not controlled by the will, but by the IRA beneficiary form. Naming an IRA beneficiary is like having a will for your IRA, and since IRA's are often the major component of an estate, this can be more important than your will. An IRA with a beneficiary (assuming the beneficiary is not your estate) bypasses probate and goes directly to the beneficiaries. There are other assets besides IRA that have 'designated beneficiaries'. The general rule appears to be if an asset has a 'designated beneficiary' it bypasses the will and probate. Assets of this type are life insurance, 403(b) accounts (Vanguard has a 403(b) beneficiary form). I also recently have seen that non-shielded accounts (at least at Vanguard) can have beneficiaries (see below), but not sure if works the same as with IRA beneficiaries. Do not think that you have named an IRA beneficiary simply because you have executed a will. IRAs should not pass through your will. If they do pass through the will, not only are they subject to probate costs, but also the (potentially) big advantage to your beneficiaries of continuing the tax shielding of your IRA for their lifetime (stretch IRA) is lost. An IRA should pass (directly) to the person(s) named as your IRA beneficiary. IRA beneficiaries are the person(s) listed on IRA beneficiary forms provided by the IRA custodian (mutual fund or bank holding the IRA). If you neglect to name an IRA beneficiary, or your IRA custodian (or beneficiaries) cannot locate your IRA beneficiary form, then your IRA will most likely pass to your estate and be probated according to the terms in your will. Who holds IRA beneficiary form? Obviously an important issue is recording and storing the IRA beneficiary election. I do not see any agreement in IRA references on this point. With a will there is little doubt that the owner keeps it. But an IRA has a custodian (like Fidelity or Vanguard) and they have the money! * Should you sign only one form or multiple copies? * Is a xerox copy valid? * Is it a good idea to give beneficiaries a copy? on file at the IRA custodian? * What if multiple signed forms have the same date and disagree, what then? If your IRA does pass to your estate, then it will be distributed according to your will if you have a will. That means that your IRA which should be a non-probate asset, will now become subject to probate and the related legal complications. An IRA owner's estate is the worst possible choice as IRA beneficiary, but becomes the default when IRA owners do not name a beneficiary. Naming a beneficiary is easy to do, and if not done much of the value of an IRA at death can be lost to taxes and costs. ** Name your IRA beneficiary now and keep an acknowledged copy - signed and dated by someone of authority (anyone with a title) at your IRA financial institution - of your IRA beneficiary designation form. Also name a secondary (or contingent) beneficiary in case your primary beneficiary predeceases you or to create an estate planning path. Let your heirs know where the form is. If they cannot find it and your financial institution has changed, merged or has simply lost the form, then you have no designated beneficiary. Reading about IRA's on the Vanguard diehards forum on Morningstar I saw that quite a few posters said they also had beneficiaries on their non-shielded (taxable) accounts. New to me. This appears to be the Transfer on Death (TOD) plan (formerly called the Vanguard 'Directed Beneficiary Plan'). I read elsewhere that a general way for an asset to not pass through probate is by contractual arrangement. I guessing that this Vanguard plan works this way, that it some sort of a contract you enter into. Does Fidelity have something similar? I need to research this. This is a 12 page document that appears to describe the plan. It's identified as, "For nonretirement accounts: Use this kit to designate or change your Vanguard® nonretirement account beneficiaries (not to be used for annuity contracts)." Here is an excerpt from the above document. It certainly looks like it works similar to an IRA beneficiary form. It states clearly that the purpose of 'this plan' (whatever that may include) it to bypass probate, and it supersedes the will. What is the advantage (if any) in doing a Roth conversion? Why is there no gain on the principal? In a traditional IRA your account in 'n' years multiplies by (1.06)^n, then at payout you get to keep 67% of it with the remaining 33% going to pay (income) taxes. If you do a Roth IRA conversion and pay the income taxes that come due (on the amount converted) by taking it out of the IRA (important! ), then your initial account principal is reduced to 67% of what it was. (This is a little tricky and technical, I am making some assumptions here.) It then grows (tax free) over n years by (1.06)^n. But multiplication is commutative, it doesn't matter whether you multiply by (1.06)^n first, then 0.67 (as in a traditional IRA) or the other way around by 0.67 first, then (1.06)^n (as in a Roth IRA). The result is the same. Your after-tax money is your original IRA account value x (1.06)^n x 0.67. From another point of view while you don't gain anything on the principal by doing a Roth conversion you don't lose anything either. So even though you have paid all those taxes when you do the conversion you have in a sense totally preserved the shielding the Traditional IRA was giving you. Plus there is the benefit that you can now shift some additional funds from being taxable to being shielded. It is the shielding of this added (outside) money, which is used to pay the income taxes triggered by the Roth conversion, that increases the return of the IRA account from 90% of market return, pre-conversion, to 100% of market return, post-conversion. A Roth conversion can appear to reduce your net worth, since your (total) accounts are now smaller due to all those taxes you paid. It can be argued this is (sort of) a psychic loss. The reality, of course, is that you only really owned 67% of your Traditional IRA, so whether you pay the conversion taxes from the IRA or with outside money, a Roth conversion does not affect your net worth. So why would anyone want to do a Roth conversion? The reason is that if you have non-shielded (taxable) money available to pay the income tax that a Roth conversions triggers, you are able (in effect) to shield the earnings on this money from all future taxes (at least that's the deal the US tax laws offer now, who knows about the future). In our example of a 100k Roth conversion the funds used to pay taxes that will be shielded from future taxation is 33% x 100k = 33k. Aside --- Am I eligible to Roth Convert? So how good a deal is a Roth conversion? Well it depends (somewhat) on whether the funds used to pay the conversion taxes come from 'fixed income' funds or 'equity' funds. Taxes must be paid annually on fixed income (like MM or bonds) earning. So in our example 33% of the 6% return (2% of balance) is lost each year to taxes, giving us an after-tax return of 4%. I assume here that a 6% equity (nominal) return can be separated into [4% capital gain + 2% dividend] with taxes delayed until sold on the capital gains but paid annually on the dividends. If the funds used to pay the Roth triggered income taxes are taken from equity, say from index funds, the saving are less than with fixed income funds. The reason is that taxes on equity funds are lower than fixed income funds, because, one, (most) capital gains taxes are delayed until the shares are sold, and two, capital gains taxes (at least now) are less than unearned income rates. In other words there is already some degree of lower taxes and tax shielding in funds invested in equity in taxable accounts. (minor update --- I was using 33% for the tax on equity dividends but this is too high, since under Bush the tax on so-called 'qualified' dividends was substantially reduced. Below I've assumed the tax on equity dividends are down from 33% to 20% = (15% fed for 'qualified' dividents + 5% state). Here are the after tax totals for a (Traditional 100k IRA + growth of 33k in a taxable account), and a 100k Roth account in 10 years (with 33k added at conversion to keep the total at 100k). Note the 33k if in equity grows at the rate of 5.60% (after taxes are paid on dividends) to 56.9k in ten years, then cap gains (@ 20%) must be paid on the growth in the account. If invested in fixed investments, it grows at 4% to 48.85k. In a 6% investment environment a Roth conversion allows you to capture 6%, which is all the market return, so your 100k Roth account grows in ten years to 179.1k, all after-tax. In comparison a Traditional IRA (100k face value, but real worth 67k) + 33k in taxable funds) grows in ten years at a slightly lower effective rate of 5.55% ((1.055)^10 x 100k = 170.8k), which reduces the after-tax total to about 171k. So a conversion of 100k account to a Roth (best case) would increase account totals over Traditional IRA results over ten years about 8k = (179k - 171k) or 4.5% more spendable cash, and over 20 years about 27k = (321k - 294k) or 9.2% more spendable cash. An important caveat is that the above analysis ignores extra cost that can easily be incurred when doing a Roth conversion. The problem is that the amount converted in a year is added to your adjustable gross income for that year and can easily for a moderate to large size conversion push you into a higher incremental tax bracket. For example, an increase in effective tax rate from 25% to 33% (or 33% to 39%) on each 100k converted can nearly wipe out the 'Roth advantage' (8k per 100k) for its first decade. Sure the Roth has the edge, but it's pretty modest, equivalent to about an extra half percent in annual gain each year. In a 6 % investment environment you capture all the 6% with a Roth conversion, vs 5.55% sticking with the Traditional IRA resulting in after tax totals over ten years increasing from 171k to 179k, or about 4.5% more spendable money. Bottom line the Roth advertised advantage of "TAX FREE GAINS" (as Ed Slott always screams) is hardly the huge advantage it is often made out to be. However, compounding does cause the Roth advantage to grow with time, as can be seen by comparing the 20 year to 10 year numbers. The Roth dollar advantage over a traditional IRA at 20 years is roughly x3 what it is at 10 years. You have an IRA and taxable funds to pay the income taxes that will come due (immediately) when doing a conversion. So why Roth convert? Here's a very simple answer. Conversion is basically a wash to the funds in your IRA (see caveat below) due to the 'multiplication is commutative' rule. But the return of the (formerly) taxable funds increases from less than market rate (due to tax costs) to market rate, because its (future) gains are no longer taxed. A market perspective is a useful way to look at the effect of doing an IRA Roth conversion. After a Roth conversion going forward you start capturing 100% of market return, obviously very desirable. Whereas over a ten year period a Traditional IRA captures about 90% of market return (5.49% vs 6%). The poorest performer is a unshielded fixed income account, which after paying annual taxes, delivers only about 67% of market return. From a charity perspective a Roth IRA conversion is a disaster. If you plan to leave the funds in a Traditional IRA to charity, then there is no way you want to Roth convert and pay all those taxes. The charity pays no taxes, so all the money you give to the government now to pay income taxes would end up in the hands of the charity. The 5% better investment gain of a Roth (after 10 years) pales beside the 33% of principal lost to taxes when it was Roth converted. The interesting result is that a Roth IRA does come out the best. In ten years it provides about 5% more than a Traditional IRA, 13.8% more than an unshielded equity account, and 21% more than an unshielded fixed income account. Roughly double these percentages for twenty years. In our contrived example the income tax rates are fixed (33%), but I in the real world a big Roth conversion (say 1/3 million) could very easily increase state and fed marginal tax rates the year of the conversion by 10% or so (say, 33% to 43%). If this is true, this is a loss of 10k on every 100k converted! This is going to take a long., long..... time (about 15 years) to get back because the gain of a 100k Roth conversion is only 660 dollars/yr (= 33k x 5% gain x 0.33% tax). This is a big negative to doing Roth conversions. It means Roth conversions can only be done a little at a time so as to not bump up incremental tax rate, but since Roth conversions have only a small gain, then the overall gain becomes very small. * Another hidden tax of a big Roth conversion is that Medicare rates will go up 1k or so that year because you are rich! It appear that 'face value' of IRA's are used in figuring estate taxes, and estate tax rates can be huge like 45%. So a big plus to a Roth conversion (even if paying high incremental tax rates) can be that the Roth conversion substantially reduces the (apparent) size of the estate. In our example a Roth conversion combines a 100K Traditional IRA and 33k taxable cash into a 100k Roth. Notes from an estate point of view every 100k IRA converted 'magically' makes 33k in taxable assets disappear from the estate. Of course, you really only owned 67% of that 100k traditional IRA, but apparently the estate tax people don't care about that and they hit your estate with a tax on a tax using the face value of your IRA. So here a Roth conversion can provides a big saving, almost half of the 33k (14.85k = 0.45 x 33k) that would have gone to estate taxes is saved from the tax man. Information below is raw info about giving to charity gathered from many sites online in pretty much random order.... It's preliminary and needs to be confirmed. In MA if you made any after-tax contributions to IRA's they come out first (tax free). Minimum required distributions do not need to interfere with investment stategy. According to WSJ's retirement column (12/08) mutual funds can simply be transferred (without sale) from an IRA to a taxable account to meet IRA minimum distribution requirements. I didn't think to mention this, but you need to delay doing your taxes until the IRA is set up. The reason (as I explain below) is that contributions to a standard IRA reduces your taxable income, so this should you save you quite a bit in taxes. If your tax bracket is 25%, then a 5k IRA contribution before April 15 for 2011 should reduce your 2011 taxes by [0.25 x 5k] = $1,250, and then the 2nd 5k would reduce your 2012 income taxes next year by the same amount. In other words opening up, or contributing to, a standard (not Roth) IRA with 10k, should reduce your taxes by about 2,500 over the next two years. This is one thing people like about tax shielding. You do not get a tax reduction if the money goes into a Roth IRA. The Roth IRA tax advantages come 40 years from now. The big difference between the two IRA types is when you pay taxes: standard IRA is when you take money out, normally in retirement. In a Roth IRA you pay taxes up front when you put money in. A standard IRA reduces your 'adjusted gross income' by the amount of an IRA contribution. It's not an itemized deduction, better it's an adjustment to income, so you don't need to itemized deductions to get the tax savings. If you earned say 60k in 2011, the your 5k standard IRA contribution for 2011 is subtracted off (there is an IRA line on the 1040 form), so you are taxed as though you earned 55k. If you are in, say, the 25% income tax bracket, this should reduce your income taxes by 25% x 5k = 1,250. with a similar reduction in taxes in 2012 from the 2nd half of the initial 10k. Here's the math on why it doesn't make much (or any) difference paying your taxes now (Roth IRA) or 40 years later (standard IRA). The correct way to figure gains of the market is by (a series of) multipliers, one for each year. If the market goes up 10%, the multiplier is x1.1, down 10% it's x0.9. For money invested for many years you stack up the multipliers: 1.1 x 1.05, x .84 etc, hopefully totally to a significant multiplier. For example 5% earned over 40 years is (1.05)^40 = 7. Now here is the kicker and why there is basically no difference in tax savings between the two types of IRAs. We start with an assumption: 'tax rates 40 years from now will be the same as now'. Obviously no one knows what taxes will be 40 years, but this is a reasonable starting point. What you really are interested in when investing for retirement is how much 'spendable' money you will end up with. Let's say taxes are 30%. In both IRA's the market gains need to multiplied by a tax multiplier, which is x0.7, since you get to keep 70% of the market gain. When you look at the final gain equations (with tax multiplier) for the two types of IRAs, they are the same! In our simple model it makes no difference if you pay your IRA taxes up front (Roth IRA) or at the end (standard IRA) you end up with exactly the same amount of spendable money. This may seem counterintuitive, I mean don't you end up paying much more tax dollars with a standard IRA? Ans yes, but it doesn't matter. For example, say you put in 5k pre-tax dollars every year into a standard IRA, and in retirement your IRA statement says you have one million dollars. With taxes at 30% the way to think of this is you have 700k spendable money and uncle Sam gets the other 300k. Now let's look at a Roth IRA. You had the same 5k of pre-tax saving to invest, but after you pay your 30% (income) taxes on the 5k you have only 3.5k to put into the Roth IRA. Every input is reduced by 30%, so in retirement your Roth IRA statement will say 700K, all of which is spendable. No difference. Leave part of your estate to charity. Your estate will save taxes after your passing. You should be aware that despite achieving tax savings of between 37 and 55 cents on the dollar, the corresponding 63 to 45 cents on the dollar will actually be coming out of your estate. (TIAA) Transfers to tax-exempt institutions or charitable trusts can be made free of gift or estate taxes during your lifetime or at death. This offshore site (http://www.sovereignsociety.com) recommends reducing your estate with offshore Trusts, Family foundations, variable annuities, life insurance. 2) the deceased must not possess "incidents of ownership" at the time of death. In other words the deceased must not have had any of the following powers at the time of death: a) right to change beneficiaries; b) right to assign the policy; c) right to cancel the policy; or d) the right pledge or borrow against the policy. -- A life insurance trust is the most effective means of assuring that the proceeds of a life insurance policy are not included in your taxable estate and it is moderately simple to implement. The average costs of drafting and implementing a life insurance trust is around $950. When you compare the cost of the life insurance premiums and the fact that up to 55% of the insurance proceeds will be paid to the IRS and not to intended beneficiaries, it often makes economic sense to implement a life insurance trust. It appears to me that use of life insurance as a tax avoidance procedure has a risk that I rarely (if ever) see commented on. Obviously money paid to an insurance company for life insurance company doesn't come back until your dead. And techniques to keep it out of your estate require you before your death to basically give away the rights to this money. It seems to me this tax avoidance procedure only makes sense for excess funds that you are positive you will never need to tap during your lifetime. You better be dam sure you won't ever need that 1M you're planning to use to buy life insurance, because once you pay the premium that money is gone, it's just been given to your heirs. Essentially it's a rich man's procedure. Slott is doing it because he's probably rich, but as usual he doesn't explain that what may apply to him may be totally inappropriate for you. The only way (I see) to mimize this risk is to buy the insurance late, late (ideally just before your death). So a key question is how many years in advance does a strategy like this need to be implemented. Can you buy life insurance to get the tax benefits at age 90? Does the law require the insurance to be in place for a period before your death? Is this law stable or continually changing? All these issues would need to be researched. * Insurance (with planning, see above) can be excluded from estate whereas a Roth IRA is included. As I understand this may make sense when the amount involved is over the estate tax exemption and will be taxed at estate tax rates. To make this concrete say 2M is withdrawn, taxes paid (at highest incremental tax rates!) and used to buy (what I assume is the equivalent of 2M) in life insurance. Obviously with estate tax rates in the 50% range pulling 2M out of the estate looks like it could potentially offer a 1M tax saving, obviously a huge advantage. Whereas if an IRA is Rothified, the same income taxes would be paid now, but the amount would still be in the estate and (it is assumed) subject to estate taxes. * Complications with trusts or beneficiary owing the insurance to keep it out of the estate. This, of course, is the 'loop hole' that makes insurance attractive. Another site warns, "The family member should pay the premiums from his/her own checking account. The IRS will examine thoroughly and will tax any insurance if it is not properly set up." * It is an insurance product, which means there is a real cost for this feature, and (very likely) at least with some of the money you are betting with the insurance company on how long you live, and one of you can lose. incremental income tax rate. Charities don't pay this tax. Charity gets 100% of value of asset. so huge estate tax on the asset is avoided. (TIAA) For gifts during your lifetime, you can take an income-tax deduction for each year a gift was made of up to 50 percent of your adjusted gross income. sum each year for life. Seems like difference between Pooled Income fund and Charitable Gift Annuity is who controls the principal. In the former its donor and in latter its charity. (TIAA) In 2002, federal tax rates on estates above $1 million start at 41 percent and rise to 50 percent for estates above $2.5 million. For federal estate-tax purposes, your estate includes your home, cars, retirement accounts, taxable investment accounts, life insurance, collectibles and so forth. You might want to leave just enough to charity to reduce your taxable estate to the magic $2 million figure should you die in 2006 to 2008. To reduce your taxable estate. Assets passing from retirement plans to qualified nonprofit organizations like Lincoln Center for the Performing Arts, Inc. are entirely removed from your taxable estate. This can potentially save your estate thousands of dollars in taxes. If you are considering making gifts to nonprofit organizations as well as to your heirs, you would be wise to give retirement plan assets to charity and other investments to your heirs. Outright Gift --- If you want whatever remains in your retirement account to pass to Lincoln Center, Inc. at your death, simply ask the plan administrator for the appropriate form needed to do this. You then indicate how you wish the remainder to be distributed. If you do name Lincoln Center for the Performing Arts, Inc. as a beneficiary, please send us a copy of the form. We will keep in with our records. Normally in retirement you need to sell off your assets to live. Say over time you sell half your assets, this cuts the value of your estate in half and triggers a continuing tax (capital gain tax) on assets sold, which would be 10% of the money received for assets with 50% cost basis (20% capital gain tax). The article is suggesting don't sell your assets borrow against them. Over time you borrowed the full value of half your asset. This gives you the same money to live on, but here the continuing cost is the loan interest cost. The loan interest is on all the money received, which in today's market might be 5%? Sure the loan must be paid off by heirs at death, but they received twice the assets than they otherwise would have, so when they pay off the loan they have left the same amount as assets they normally would have received. Once you have passed the unified credit exemption limit, giving gifts makes even more sense because the effective tax rate on gifts is lower than on an estate. Gift tax is calculated like a sales tax; the amount of the gift is multiplied by the tax. Estate taxes, however, are levied on the entire estate, including the money you send the IRS to pay those very estate taxes. While in principal there is an gift tax to be paid (by the giver) if the gift to (each) person is over 12k/year, in practice (i.e unless the gift is huge) the tax is zero. The gift tax is integrated with the estate tax and there's something called the "unified credit" which is nearly 1/3 million dollars. Until this amount is exceeded the tax due will be zero, however, you are supposed to file a form with the IRS (Form 709) about the gift so they can can track it. A gift above 12k affects the value of your estate, which of course only matters if your estate is big enough to be taxable, and it's paid when your dead. Here are IRS links on the gift tax. The 2nd link has an example showing how the Unified Credit works to cancel the gift tax. The key sentence below is this: "The rules let you give a substantial amount during your lifetime without ever paying a gift tax. As of 2008 the amount is $1,000,000." It also says, The person receiving a gift never pays a tax regardless of how large the gift. A gift is not income. Notice the double talk below. It ends up recommending keeping below 12k after just explaining that this limit is (in most cases) no big deal, just an IRS reporting limit, essentially a bookeeping entry that might (might!) increase estate tax when you die. Everyone's situation is different, so tax advisors tend to give conservative (in my view over-simplified) guidance that it's best to stay below 12k/yr. Clearly the main purpose of the law is to prevent people from giving away their money prior to death to avoid estate taxes, but if your estate is (moderately) below the estate tax threshold and will not be subject to estate taxes, the 12k limit is not a real limit. It's just a threshold above which you need to do a little figuring, and isn't that why you have an accountant! --If you give more than the annual exclusion amount to one person in a single year you'll have to file a gift tax return. But you still won't have to pay gift tax unless you gave given a very large amount. The rules let you give a substantial amount during your lifetime without ever paying a gift tax. As of 2008 the amount is $1,000,000. -- You don't use up any of this amount until your gifts to one person in one year exceed the annual exclusion amount. For example, if you make a $14,000 gift in 2008, you have used up only $2,000 of your lifetime limit. -- Any amount you use out of your lifetime gift tax exclusion counts against the estate tax exclusion, which is $2,000,000 as of 2008 and $3,500,000 as of 2009. This means that if you use $250,000 of the limit by making gifts during your lifetime, you have reduced by $250,000 the amount that can pass through your estate free of the estate tax. So you shouldn't ignore your lifetime limit even if you feel certain that your lifetime gifts will never add up to that amount. It pays to plan your gifts around the annual exclusion amount and the exclusions for educational and medical expenses wherever possible. A family accountant was asked to comment. His response is consistent with above and updates the numbers. He reports the direct gift tax limit is now much higher (5M) and the annual reporting threshold a little higher (13k), but the scaling back of estate tax threshold by large gifts, which I suspect may be the most important consideration, he didn't mention. -- There is no tax consequence to the recipient of a gift, it come to them tax free. The donor must file a gift tax return for any gifts to any one individual who is given more than $13,000 during a calendar year. The donor has a lifetime maximum of $5,000,000 before they have to pay a tax on gifts to individuals. Reflect carefully on what you want your will to accomplish and put your thoughts into writing. Then call an attorney to draft the document for you. A will always should be prepared by an attorney to be certain it conforms with federal and state regulations. Careful planning for the disposition of retirement plan assets—IRAs, 401(k) plans, 403b plans, and other qualified pension or profit-sharing plans—can help to avoid undesirable tax costs. In certain situations, gifts to Wharton of retirement account balances can improve the donor's overall tax consequences, increase the amounts passing to heirs and reduce income and estate taxes. Retirement assets can be subject to multiple levels of taxation. The combination of federal income, estate and excise taxes can seriously erode the value of retirement savings. First, as a rule, retirement savings are subject to federal income tax as the funds are distributed to the beneficiary(ies). Second, the law requires that certain minimum distributions be made from retirement accounts after the individual attains age 70 and 1/2. Failure to take the required amount results in a 50% penalty tax on the undistributed amount. Third, at death, any remaining retirement account balance is included in the calculation of the gross estate. Consequently, retirement savings can also increase federal estate taxes. A generation-skipping tax may also apply to substantial account balances that pass to grandchildren or to other remote generations. Finally, after death, payments made from retirement accounts to the designated beneficiaries will be taxed as received by them at ordinary income tax rates. Thus, the overall tax rate assessed on passing retirement assets to your heirs can exceed 75%! Rather than lose the bulk of these retirement assets in taxes, some Wharton donors elect to give these assets directly to the School, while using other, less-taxable assets to pass on to their children and other beneficiaries. To do so, a donor makes Wharton the beneficiary of each retirement plan he or she wishes to gift to the School. Another advantage to making a cash gift is that it is deductible against up to 50 percent of the donor's Adjusted Gross Income. "Giving while you're living" is a tax-wise idea. The reason is the income tax deduction—both federal and state. Charitable gifts made during your lifetime provide an income tax deduction not available through a bequest gift. Because the outright current gift is no longer includable in your estate, these gifts ultimately avoid estate taxes as well. Giving assets is better than giving cash, especially long-term, highly appreciated assets. This is because of the dual tax benefit of an income tax deduction based upon the fair market value of the gift plus the added benefit of avoiding the capital gains tax. Planned giving (i.e. charitable remainder trusts; charitable gift annuities) provides three powerful benefits. It provides significant income tax and estate tax benefits and provides a lifetime income stream as well as a significant remainder gift to charity. Life income plans offer you the opportunity to make a current commitment to charity, receive a lifetime income stream for you and your spouse, avoid an immediate capital gains tax on a gift of appreciated property, receive an income tax deduction for a percentage for the total amount gifted and remove the asset from your estate which may provide significant estate tax savings. Don't forget about your pension plan as a giving opportunity. "Income in respect of decedent" assets such as pension plans, IRAs and other qualified plans generally provide better tax benefits in a testamentary gift. The best type of asset to gift to charity through an estate will normally be an asset that produces taxable income. Most assets that an heir inherits are free from income tax. However, with the exception of a surviving spouse, an heir will pay income tax on amounts received from a decedents' retirement plan. If you are going to make a charitable bequest, it is usually better to transfer assets subject to income tax to charity and transfer non-taxable assets to heirs. Bequests are gifts made by will. They are the most popular type of planned gift and have been crucial to the extraordinary growth and success of The Museum of Modern Art. Whether you wish to provide general operating income or to support a specific department or program at the Museum, your bequest expresses your lasting commitment to MoMA. A bequest to the Museum may also help you meet your financial and estate-planning goals, since an estate and gift tax charitable deduction for the entire amount of the gift is allowed. While your estate plan will be prepared by your attorney in consultation with your tax and financial advisors, the Museum's Office of Planned Giving would be pleased to discuss any of the various giving opportunities with you. * A cash bequest of a specified dollar amount. * A specific bequest or devise of property, by which MoMA receives specified assets, such as marketable securities, an interest in real estate, or tangible personal property (e.g., artwork, antiques, or rare books). * A residuary bequest or devise, by which the Museum receives all or a percentage of the remainder of your estate after specific legacies, debts, taxes, and estate expenses have been deducted. * A contingent bequest or devise, by which property is distributed to MoMA only if you outlive your named beneficiaries. * A testamentary provision establishing a charitable remainder trust, in which one or more named beneficiaries receive income for life or for a term of years, after which time the assets pass to the Museum. * A testamentary provision establishing a charitable lead trust, which pays income from the trust to MoMA for a period of years or for the life of one or more individuals, after which time the assets pass to your heirs. * Qualified retirement plan assets, by which you name the Museum as a beneficiary or contingent beneficiary of all or a specified percentage of your plan assets. With this type of bequest, you can support the Museum while also removing from your estate assets which may otherwise be subject to heavy taxation. Generally, if you intend to make both noncharitable and charitable gifts at death, it makes sense to use your tax-deferred retirement plan assets for charity and other assets for heirs. Retirement plan assets can also be placed in a testamentary charitable remainder trust to provide income to your heirs for life or a term of years, with the remainder interest passing to MoMA. Polly Royale, a widow, has one son. Mrs. Royale and her husband accumulated an estate of several million dollars over the years. Mrs. Royale would like to leave as much of her assets as possible to her son. She would also like to leave a bequest in her estate plan to Cal Poly. One of her assets is a $500,000 IRA (Individual Retirement Plan), which she has designated to her son via the IRA administrator's beneficiary designation form. She visits her attorney to discuss her desire to leave a bequest to Cal Poly. He lets her know the bad news that if she were to die and leave the assets of her IRA to her son, after deducting approximately $100,000 for federal and state income taxes and approximately $250,000 for federal estate taxes, her son would receive the remaining $150,000 (or 30 cents on each dollar that was in the IRA). The attorney recommends instead that she make her gift to Cal Poly from her IRA. Because the Cal Poly Foundation is a 501(c)(3) tax exempt organization, the entire $500,000 will be available to the University at her death. But retirement accounts can be subject to a combination of federal and state income and estate taxes that can seriously erode their value. Retirement savings are subject to federal and state income tax as received, either by the retiree or the retiree’s heirs. Because retirement assets are included as part of the taxable estate at death, the assets in qualified retirement plans can also be subject to federal and state estate taxes. First, retirement savings are subject to federal and state income tax as received. Second, the law requires that certain minimum distributions must be made from individual retirement accounts after the individual attains age 70 1/2. Third, at death, any remaining retirement account balance is included in the calculation of the gross estate. Consequently, retirement savings can also increase federal estate taxes. Finally, after death, payments made from retirement accounts to the designated beneficiaries will be taxed as received by them at ordinary income tax rates. While retirement assets are often overlooked as potential charitable gifts, they can be a convenient, tax-favored giving option for charitably minded individuals. Careful planning for the disposition of retirement plan assets can help to avoid undesirable tax costs. Properly structured gifts of retirement account balances can improve the donor’s overall tax consequences, increase the amounts passing to heirs and escape income and estate taxes. Ann, a widow, has recently died. She has one surviving child. Her estate assets include her home, valued at $300,000 and an Individual Retirement Account of $300,000. Ann’s will divides her estate equally between her child and the University of Maine Foundation, specifying that her child will receive the IRA account, and that her house will go to the University of Maine Foundation for the benefit of the University of Maine. The house will pass to the Foundation with no estate or income tax consequences. The IRA account given the child will not create a taxable federal estate. However, the amounts paid from the IRA will be taxed at the child’s income tax bracket when received. If the child is in the 31% tax bracket, the amount remaining after income taxes of $93,000 will be $207,000. The child's inheritance has been depleted by nearly 1/3! Ann should leave her house to her child, who can sell it immediately, with no federal income tax or capital gains taxes if it is sold at Ann's date of death value. The child will receive approximately $300,000. The Foundation should be designated as beneficiary of the IRA account worth $300,000. Because the Foundation is a tax-exempt organization, it will not be subject to income taxes on the IRA distributions. This simple rearrangement saves $93,000 in taxes and increases the amount passing to Ann's heir! ** The gift of a qualified retirement plan or IRA is one of the most complex types of gifts. It is suggested that if a donor is interested in this type of gift, one of our professional giving officers should be contacted to work with the donor, the donor's financial advisor, accountant, or lawyer. The University of Maine Foundation has professional giving officers ready to work with you and your advisors. We may be reached Monday-Friday between the hours of 8 am and 5 pm by calling 1-800-982-8503 or via email at umainefoundation@maine.edu. When you participate in a retirement plan, such as a 401(k), 403(b), Keogh, or IRA, you set aside money to use later. If you die before you receive any lifetime payments, the accumulated funds go to the beneficiary or beneficiaries that you've named. If you die after your retirement benefits have begun, the remainder in your fund is paid to your beneficiaries. It is possible to donate all or part of your retirement plan to a charitable organization by naming the organization as first, second, or last beneficiary for part or all of the remainder. Your spouse must sign a spousal waiver in order to pass on benefits to which your spouse would be entitled. Relatively few people think of retirement assets—that is, assets held in qualified retirement plans and individual retirement accounts (IRAs)—as tools for giving to MIT. In fact, these can be flexible and useful assets in a larger philanthropic strategy. Changes in federal regulations have made it possible to name MIT as a beneficiary of an IRA or qualified retirement plan, as part of your family's overall financial plan. Anthony Luciani, an MIT alumnus and a widower, is in the process of estate planning. His will divides his estate between his son, Joseph, and MIT. Along with his other assets, Luciani has an individual retirement account (IRA) worth $300,000. He names MIT as beneficiary of the IRA and passes his other assets to his son. Joseph (Joe) Luciani is in the 33 percent tax bracket. If his father were to pass his IRA outright to Joe, the amount remaining after income taxes would be reduced by one-third, to $200,000. If Joe took out the minimum annual distributions from the IRA, they would be subject to income tax when he received them. But, since MIT is a tax-exempt organization, the Institute will not be subject to income taxes on the IRA distributions. * Given 100 percent of his IRA assets to support MIT’s mission. As long as these charities are qualified as tax deductible, you want to leave assets like appreciated taxable assets and, especially, Traditional IRA funds. The charity gets the FULL amount and there are NO taxes paid either by your estate OR by the charity. You can very easily donate appreciated stock and mutual fund shares, get the immediate tax deduction, have the money invested at the risk level you choose, then (as you so request) have the money sent to the charities you request. Many charities (IMO, especially churches) are horrible at getting too much money too soon, and are often better off with a regular stream of annual donations. That might not fit your tax needs and desires. My wife and I are building up this fund with donations of appreciated stock from a previous employer, and making some charitable contributions from this fund. As we get into retirement, we plan to reduce the amount we give to church, charities, etc. directly by writing a check, and have more sent from this fund. You can "pass on" the rights to designate charities to others, even after your death. Or, upon your death, you can have the balance sent to the charities of your choice. When this stock is all donated in a few years, I plan to donate some other stock where I did dividend reinvestment, and more research would be needed. The donation of taxable appreciated mutual funds to avoid capital gains is a little obscure. It's generally an after thought in a discussion of donation of 'appreciated stock'. MIT provides special instructions on how to do (sort of) a fund to fund transfer to an MIT Fidelity account. So it does appear possible, but whether it has the same tax advantages as gift of appreciated stock is not confirmed (in my mind). Almost for sure it does, if done right. If it fits your situation and lifestyle, etc., consider donating appreciated stock to a charity, church, etc. You get the full value deduction and the church/charity gets the full value and nobody pays any taxes. Neither do you have to figure out any cost basis, etc. If you want to get rid of more than you wish to donate to the church/charity in one year, then consider a donor advised fund, where you can donate quite a bit, then have it distributed to the church/charity over a period of years. Vanguard has such a fund, as does Fidelity (we use Fidelity). (got a Fidelity booklet on Fidelity gift program referred to in online post above. 'Charitable Gift Fund' --- "public charity with a donar-advised fund program"
Result -- Charity gets same amount (60k), same charity deduction on income tax (20k saving). The difference is simply that the fed and state capital gains on the appreciated value (4k) are not paid with a security transfer. Caution --- (at least as of 2011) there is a big problem with the Fidelity example above. There is a cap on how large a charity deduction is allowed for a gift of an appreciated security to a donor advised fund. It is 30% of AGI (adjusted gross income), so in Fidelity example almost a 200k adjusted gross income would be needed to avoid the cap with a 60k charity deduction (in one year). (Claimed) Advantages --- separate tax deductions from charity giving, you get an immediate tax deduction. Flexibility -- support multiple charities with single contribution, break up your gift into a stream of payments (good for churches). Financial experts say deferred annuities are a good option for wealthy elderly investors looking for ways to transfer savings to their heirs while avoiding large tax payments. The vast majority of annuity sales require buyers to wait as long as 10 years to begin receiving benefits. Such contracts, known as deferred annuities, made up 97 percent of all annuity sales last year. Due to recent legislation, there's now a way in some states that makes it possible to transfer your stock, bond, and mutual fund assets directly to your beneficiaries outside of probate and without the necessity of a trust or will. You can designate beneficiaries for any one or more of your individual or joint non-retirement accounts that are held by a securities broker or mutual fund company which offers a Directed Beneficiary Arrangement (DBA), regardless of your state of residence. Upon your death ownership of these accounts will be transferred directly to the beneficiaries that you specify – avoiding probate and without the formalities and expense of a trust. I think you should consider Vanguard's free, but little known, Directed Beneficiary Plan. Ask for their brochure. DBP allows you to hold title to the fund yourself, but you can name beneficiaries which will transfer title almost as easily as a joint account. DBP keeps the fund entirely under your control--unlike joint ownership where one owner or the other could wipe-out the account. One issue might be; which plan offers the most protection from creditors? It is different State by State. Good luck. I find it comical that MIT first offered this deal ('share in our endowment investment returns') just a little before its endowment returns (along with many other college endowments) totally tanked in 2008 with the endowment losing something like 30% of its value in one year. Curiously I have never heard about a word about this 'deal' since. Many large university endowments have had spectacular investment gains in the last 10-15 years using a variety of investment strategies and asset classes not available to the public, like private investments, commodities (buying forests! ), and top hedge funds. Now some universities are (supposedly) offering access to their endowment investment portfolios if you set up a charity remainder trust. If you buy a regular annuity from an insurance company, you get maybe 8% per year (5% gain + 3% capital return) with a payout that is usually fixed. Here you are also (pretty sure) giving away the money and accepting an initial annuity like payout of 5% vs 8%. If the MIT endowment earns say 8% a year, then in 6.1 years the payout would grow to equal the fixed annuity (1.08^ 6.1 = 1.6 = 8%/5%). In about 12 years the total accumulated payout would equal the fixed annuity (maybe 15-17 years if time value of money is account for). Obviously the 'return' compared to a fixed annuity depends strongly on how long, or how well, university endowments continue to outperform, which becomes less and less likely over time. At 5% annual endowment gain the crossover time rises from 6.1 yrs to 9.6 years (1.05^9.6 = 1.6) and your probably dead before total payout exceeds a fixed endowment. It would be interesting to compare this MIT variable quasi-annuity with a TIAA-CREF variable annuity. I have determined that a major portfolio reorganization, whose goals are a reduction in portfolio equity and a reordering of investment goals, is going to involved substantial selling of taxable funds, which will trigger substantial (fed + state) capital gains taxes of (approx) 20% of the fund's appreciation. ** Simplest view --- In a comparison hold equal the amount charity gets (10k), then charity income tax saving is same. In one case you sell stock, paying fed and state cap gains taxes with outside money. In the other case the charity sells the stock so no capital gains taxes are paid. There is really only one tax advantage you save fed + state capital gains tax, which is about 20% of the appreciated value. For a 10k gift to charity with mutual funds appreciated x2 (i.e. cost basis 1/3rd of value), the outside money that would have been needed to pay the capital gains tax is 0.20 x 6.66k = 1.3k. This is the advantage of paying the charity with highly appreciated securities rather than cash. From another point of view --- The real (post tax) value of 10k of 2x appreciated equity is only 8.7k. So for charity to receive 10k I can pay with 10k of cash or 8.7k worth of stock! In both cases 3.33k = (0.33 x 10k) can potentially be recoved from 10k fed charity deduction. Big question is, Can I do a portfolio reorganization now and capture this double charity tax advantage without having to make a huge charity contribution to one (or a few) charities this year? I am hoping that maybe the charity plans of Fidelity or Vanguard will do this. I want a plan that allows me the flexibility to spread out charity contributions over time and over many charities (and of course without high cost). ** Alternate minimum tax eating away at large charity deductions (Maybe a third loss in deduction?? Charity deductions still count but AMT incremental rates are lower (26% ?or 28%?). (Is it 50% for direct simple charity contributions?) NO, 30% limit for DAF. ** Big caveat is that tax deduction limit for all non cash funding, which includes funds, is (only) 30% of adjusted gross income. (seems weird that funds aren't treated like cash). From other source there is carryover of excess (> 30% of AGI) charity funding, but the carryover period is only five years. ** Note the correlary of the (short) five year carryover is that a charity deductions bigger than [5 x 0.3 AGI = 1.5 AGI] is simply wasted! Excess deduction (> 30% AIG) have a 5 year carryover. The maxium deduction must be taken each year. -- immediate tax deductions to donors. The deduction (apparently) must all be taken in the year assets are transferred to the fund. -- In Vanguard plan funds are not transferred in kind! (Fidelity looks similiar) The equity is sold and reinvested in any combination of nine nine pools of stocks and bonds and can be shifted between them online. They are:Moderate Growth, Growth, Total Equity, Total U.S. Stock, Total International Stock, MM, Short-Term Bond, Total Bond. -- Vanguard (donar advised) fund cost is 0.78%. -- Looks like if you die and don't name a sucessor, then in effect Vanguard (appears to) keep the money remaining in the fund! "will assign any remaining program account assets to its General Fund"
How it works is you send your annual charity money to Fidelity, and they mail out checks to the charities you recommend. It has two big advantages. One,for IRS you have only one charity record and date to worry about (not a dozen). And two, while Fidelity charges a $100/yr for this service, they make it practical for you to fund the charity with your most highly appreciated stock or mutual fund (can use non-Fidelity funds too). Say you have 10k of a taxable mutual fund that has tripled, then its real value to you (its after-tax value) is about 8.7k. So you do your charity funding not with 10k in cash, but with 8.7k worth of stock, saving 1.3k (13%). The tax saving results from the fact that charities don't pay capital gains tax, so both fed AND state capital gains taxes are avoided. It would be sweet if IRA funds could be used, because essentially they have a zero cost basis, but the recent (temperary?) 'IRA charitable rollover' (over age 70 1/2, 100k limit) IRA withdrawal loophole specifically excludes donor advised funds. From discussion above if you have substantially appreciated stock or mutual funds in a taxable account, this is what you want to use to fund your regular annual charity giving. The saving is no capital gains tax (fed + state) need be paid. 10k to charity this way vs cash increases tax saving from about 3.33k (fed charity deduction at 33% incremental rate) to about 4.67k = (3.33k + 0.2 x 6.66k cap gain tax not paid). The trick is how to do this? Andrew Tobias points out this is why you want to use a DAF (donor advised fund). Using a DAF makes funding charities with appreciated equity practical. This is what they are good for. Tobias has long used and recommends the Fidelity DAF, and from what I see Fidelity is the best choice. With a DAF no hassling with charities one by one to transfer them equity. A direct to charity transfer may makes sense with a one time big gift (deduction caps! ), but not for charities you give a hundred bucks to each year. I have not yet used a DAF, but I plan to open an account and will know more next year. Here is what I know now. Fidelity is for the little guy. Vanguard is for the rich man. Use Fidelity. Fidelity minimums are 5k to open account and 50 min gift. (Vanguards minimums are 25k to open account and 500 min gift, confirmed in 2011). Fidelity numbers work well for 10k or so in annual charity giving, and the IRS appreciated security cap will not be hit if AGI (adjusted gross income) is 33k or higher. How it works is you send your annual charity money to Fidelity, and they mail out checks to the charities you recommend. It has two big advantages. One, for IRS you have only one charity record and date to worry about (not a dozen). And two, while Fidelity charges a $100/yr for this service, they make it practical for you to fund the charity with your most highly appreciated stock or mutual fund (can use non-Fidelity funds too). Say you have 10k of a taxable mutual fund that has tripled, then its real value to you (its after-tax value) is about 8.7k. So you do your charity funding not with 10k in cash, but with 8.7k worth of stock, saving 1.3k (13%). The tax saving results from the fact that charities don't pay tax, so both fed AND state capital gains taxes are avoided. Reduced paperwork --- From IRS viewpoint you are only giving to one charity (DAF itself). So only charity receipt is needed, only one charity to list on IRS 1040, only one charity give date to worry about for income tax purposes. No longer need to collect and save receipt letters from charity for IRS records. A form is required for fed income tax IRS 8283, but Fidelity provides this. -- The IRS requires completion of form 8283 for all non-cash charitable contributions of $500 or more. Easy to give online (says Tobias) --- Once account is set up and charities identified. (A quick check found most of my charities, except maybe one small one. Everything listed with IRS is supposed to be there. If one can't be found it can always be funded as before, with most of the benefits preserved.) Fidelity mails out checks, and I am told you can include some text with (or on) the checks. Substantial tax saving --- Save both state AND fed capital gains taxes. For 10k of tripled equity this is a tax saving of 1.3k. You are gifting 10k to charity with 8.7k worth (after-tax) of stock or mutual funds. Low cost --- 100/yr fee or 0.6% (for >16k). No minimum, can run account to zero and it will stay open. Investment options have some very low cost domestic and international index funds. Bond fund at 0.32% was about x3 higher than Vanguard eq bond fund. ** Can't be used for an IRA charitable rollover --- On the one hand a donor advised fund seems like a normal charity, but charities are graded and it appears this one has some tight restrictions. Over age 70 1/2, 100k IRA charitable rollover funds cannot be moved to a donor advised fund. It is not qualified for that (says Fidelity). Importing non-Fidelity funds is slow --- Transferring Vanguard mutual funds to Fidelity DAF is certainly slow (up to 4 weeks, whereas Fidelity funds come in in one day), but am assured by Fidelity there is no hassle. Told it can all be done online with Fidelity pulling money from Vanguard. A lot of people pay with Vanguard funds. Vanguard faster than most. Start by Thanksgiving to be sure process completes by end of year. Sell date uncertain by few weeks --- The slow transfer process (weeks) likely makes it uncertain when imported stock or funds will be sold. Keep deductions in line with AGI (50%, 30%, 20% limits) --- Too big a charity contribution in one year is a bad idea tax wise. Charity deductions each year need to stay in sync with AGI (adjusted gross income), not just because of the cap, but the risk of running tax to zero. A DAF (donor advised fund) can easily tempt a large one time donation, this I don't think this is wise from a tax viewpoint. Need to confirm, but I think charity deductions must be taken in the year they occur, and I don't think you can carryover charity deductions from year to year (Well, you can if you exceed the AGI limit, but it looks tricky. See below. Excess charitable contributions can be carried forward for the next four years after the donation.) Too large a charity deduction, even perhaps substantially below 30% of AGI cap, can drive net fed tax to zero. Once this happens any additional charity deduction is likely wasted. Importantly all deductions combined [charity + investment, taxes, etc] are limited to 50% AGI. This was a tough nut to crack, but I cracked it. The limit for appreciated securities for Fidelity Charitable (a donor advised charity) is 30% of AGI (adjusted gross income). Charity deduction rules are very complicated. Try reading IRS Publication 526 ('Charitable Contributions') and the mind boggles. There are 50% charities and 30% charities, and it nearly impossible from the guidelines and examples of pub 526 to figure out in which class a particular charity falls, for example, arts organizations are never even mentioned. The IRS advises calling your charity and asking, "Are you a 50% limit organization", and the IRS says they should be able to tell you. Well I called Fidelity Charitable and asked this question using exactly the language that the IRS advised. The first Fidelity response was 'I don't know, never heard that question before' (Fidelity Charitable being one of the largest charies in the USA! ), but after a consultation at Fidelity the answer came back "Yes". I had already figured out it was yes, because on the Fidelity Charitable web site it say the limit for appreciated securities is 30% of AGI. Here's the explanation of the confusing 30% or 20% limit for appreciated securities. Both 50% and 30% charity classes have lower limits for appreciated securities. For the '50% charities' the limit is 30% of AGI and for the '30% charities' the limit is 20% of AGI. Not only is the terminology confusing, but online 'references' often get it wrong. They oversimplify and imply the limit for all appreciated securities is always 20% of AGI, but it is not. It is (I think) a special case, the 20% AGI limit for appreciated securities only applies to the 30% charity class. Fidelity Charitable is a 50% limit charity, so I suspect it is very likely that all the other large donor advised charities (Vanguard, Schwab, etc) also are, and in fact I found a reference that says this. Charity deductions not allowed in some states --- I read charity deductions are not allowed in a state taxes of a few states and see MA in the list. If this is so (it is), it reduces the charity benefit quite a bit. I reduced my fed income taxes 5k this year using an undocumented 'trick' in TurboTax by reducing my claimed charity deduction for gifts of appreciated stock. This is allowed by the IRS as shown below. In other words the IRS is saying, it may sometimes be to your benefit to claim a charity deduction of appreciated stock at it cost basis rather than its fair market value. I found this year it applied to me, and it led to a big reduction in my taxes. By only claiming as a deduction 27k of a 50k charity contribution of appreciated stock (mutual funds), i.e. claiming the deduction at its cost basis, I increased my allowed total charity reduction for the year by 20k saving me 5k in federal income taxes! When would this apply? It applied to me because I was recently diagnosed with cancer, I know I don't have too many more years, so I have begun giving higher amounts of money to charity while alive even though I know it is not optimum tax wise. The result last year was my charity contributions were high relative to my AGI (adjusted gross income) causing me to be hit by IRS limits on the amount of charity deductions allowed. TurboTax told me at my AGI I could only claim a 59k charity deduction for 100k donation of appreciated stock. I was running into the IRS '30% limit' of AGI for appreciated stock. Sure the balance of 41k of unused charity contribution was carried over to following years, but in my situation this is worthless. I want to reduce my taxes as much as possible this year. Is there any way to raise the allowable charity deduction this year? There is. The 'trick' is to lower the claimed charity deduction for some of your gifts to their cost basis. The IRS then treats the appreciated stock gift as a 'cash' gift, which is subject to 50% limit, very likely allowing the total charity deduction on your Form 1040 to rise. In my case from my allowed charity deduction rose from 59k to 79k, an increase of 20k, which in a 25% tax bracket is a tax reduction of 5k (8.3k in a 33% bracket). Of course the tradeoff is charity carryovers are lost, but to me that's a good trade. My situation is probably uncommon. I have never seen an article about this. I discovered this recently by playing with TurboTax, using overrides to adjust my charity deduction and was astounded that when I reduced it enough, I saw my refund going up, way up! I was initially baffled, but with trial and error I found the sweet spot, highest refund, occurred when I set my claimed charity deduction at the cost basis of a recent gift. Then with a search target I found the IRS text I quoted above. Bottom line -- I found TurboTax for 2014 is capable of implementing this IRS policy by the use of overrides. Call it an undocumented feature. Do I fault TurboTax for not advising me of this? Well a little, but as I stated my situation is probably quite uncommon. I would caution that implementing this cleanly in TurboTax using overrides is tricky as there are several levels of worksheets involved, but it can be done. Wiki has a nice list of these funds here. There are several types charity trusts, but many appear to feature generating an income stream from the contribution. The type that seems most appropriate (no income stream and flexible giving) is the 'Donor Advised Fund' . It's called "donor advised" because technically when you donate the assets to the fund you lose control, the DAF funds themselves technically are charities. Having given away the money to the DAF you can't 'command' them to give it away, but the work around is that you can 'advise' them to do so, and Fidelity says they will follow your advise, if the fund is a registered legal charity. -- A donor advised fund is a cost-effective alternative to a private foundation. The donor may set aside funds for charitable intentions during high-income years while making the actual distributions to favored causes at future times. A charitable income tax deduction is available for the full amount in the year that the donor makes the contribution to the fund, even though disbursements to qualifying charitable organizations can be made at any time in the future. A DAF provides professional management of assets and avoids estate taxes. A DAF offers the many benefits of private foundations without the restrictions, administrative burdens and high costs associated with them. It appears that tax deductions is (only) for the year in which funds to the fund are made. Andrew Tobias (Only Investment Guide You Will Ever Need) recommends using a DAF fund (Fid below or Van eq) for your annual charity giving. He says if you give a few thousand (total) split among many charities each year, he recommends that you funnel it through a DAF. The reason is that while in principle you can work with a charity to transfer appreciated securities directly to them, it's a paperwork hassle. OK for a big gift or two, but not for a lot of small gifts. That problem goes away he says using a DAF fund. Transfer the appreciated funds (or stock) from taxable accounts to them and direct them to make the distributions. Once you set this up he says, the next years it's just a few clicks. He says Fidelity will do gifts as small as $50 (confirmed) and he has used their charity gift fund for years. Reduce paperwork --- from IRS's viewpoint you have given to 1 charity not 15! Say your charity list is 15 charities. With direct payment to them you need to give to all of them before Dec 31 (a procedure simplified by setting them up in bank Bill Pay), but annoying a letter from each charity must be looked for and saved for tax records. This is 15 letters dribbling in over many weeks! But if a DAF is used, from the IRS's point of view you are giving to only one charity, not fifteen! The Fidelity DAF is a charity. Once you have sent them money or securities, you have given the money away. 15 thank you letters will probably dribble in from the 15 charities, but they can be thrown away! The only receipt needed for IRS is from Fidelity DAF. The Fidelity DAF web site is very clear about this. 1) Timing --- tax deduction date depends only on the date the money/securities are moved to Fidelity DAF. 2) Tax records --- Fidelity DAF will send a receipt. This is the only record needed for IRS. The thank you letters from the charities have no tax purpose and can be thrown away. Charity funding with shares of a mutual fund that has a cost basis 1/3rd of its current value will provide an additional saving of 13% of so of the value of the gift. Thinking about this, I was surprised to see that saving is not only federal capital gains taxes it is state capital gains taxes too! The reason is the shares given away are not sold (they are sold by the Fidelity DAF charity), hence there is no capital gain to report. Let's compare using 10k cash vs 10k of x2 appreciated security (cost basis 1/3rd of value) for charity giving. In both cases charity gets 10k. In both cases a 10k charity deduction on federal income tax (but probably not state income tax), which saves 3.33k (for 33% incremental rate, assuming other deductions meet the standard deduction threshold). Important --- This assumes the amount of appreciated securities in a given year is less than the 30% cap of adjusted gross income. To get 10k to charity in one case I am out 10k cash, but in the other case I am out equity that was listed in my account has having 10k value, but 10k of equity appreciated x2 has value to me (after tax) of only 8.66k = [10k - (15% fed + 5% state) x 6.66k gain]. In other words using a DAF and paying with highly appreciated equity I have given up equity worth 8.66k to me while reducing my fed taxes by 3.33k , so net cost to me of a 10k gift to charity is [8.66k - 3.33k (tax saving) = 5.33k], barely half what the charity receives! Another bonus is that its trims a highly appreciated equity in the portfolio, a mutual fund that would typically be last on the sell list as it triggers the largest taxable gain. Looks like another (major) advantage of a DAF is beneficiary flexibility. Rather than putting a particular charity as a beneficiary on an IRA (or in lieu of such) in advance the DAF can be used. This then later allow you designated account manager (after your death) to divide up the IRA money among various charities (to be decided later)! -- You may name the Gift Fund as a beneficiary of cash equivalents, securities, or other property in your will or other testamentary instrument, or as a benefi ciary with respect to other non-probate property, including but not limited to: An Individual Retirement Account (IRA); A brokerage account or other account allowing designation of benefi ciaries. Another way to use a DAF is to put in 100k (min), which is then managed by Fidelity like an endowment with only interest given away annually and endowment preserved. --- (Fidelity) Each individual Giving Account is assessed an annual administrative fee of 0.60% of Giving Account assets or $100, whichever is greater. Looks like this fee is on top of mutual fund fees, but these can be low: US index and inter index funds both available at 0.07% and bond index fund at 0.32%. * I called Fidelity and asked about using Vanguard mutual funds. No problem. Allow four weeks, but lots of fund come in from Vangard and they are pretty fast. * I asked Fidelity about the minimum account balance needed to hold account open (5k initially to open). of people do this I am told. Fidelity funds are processed in one day. Outside fund take up to a month! Can't wait until end of year! One reason Tobias likes this charity giving method is he buys stocks. If you say make your own 'index funds', by buying 30 stocks, a major reason to do so is for the tax advantages, since even in a year there will probably be one or two big losers and gainers. Sell the big losers to cancel capital gains and use the big gainers for charity giving. You are allowed a current income tax deduction of up to 30 percent of your adjusted gross income for a gift of appreciated securities or real estate. You can carry over any excess for up to five years. If you have held the asset for more than a year (so called “long term capital gain assets”), your deduction will be based on the full fair market value of the gift. Better yet, even if the property has appreciated substantially since you obtained it, you would not pay any tax on the built-in gain when you make your gift. ** (still valid?) At one time, the appreciation was considered a preference item subject to the Alternative Minimum Tax, but this AMT no longer applies. There is even an election you can make that boosts your current deduction from 30 percent to 50 percent of your adjusted gross income - if you are willing to reduce the amount of the deduction by the amount of appreciation. If the appreciated securities or real estate you contribute are considered “short term” (held for 12 months or less), your deduction is limited to your “basis” (essentially, what you paid for the asset) rather than its fair market value. However, you can take a deduction for up to 50 percent of your adjusted gross income and still carry over any excess deduction for up to five years. The main advantage or rolling a 403(b) to IRA is breaking free of the limited menu of investment choices a 403(b) plan offers plus the convenience of having all assets together. However, there is (apparently) a loss in ERISA legal protection of retirement assets if sued. * Wide Range of Investment Choices. You get the flexibility to invest your IRA in almost every type of mutual fund or individual security. * Convenience and Control. Your assets are in an account that you control, allowing you access to your money if you need it (taxes and penalties may apply, however). When you retire, you can select from a variety of flexible payment options. * Some 403(b) are covered by ERISA, but IRAs are not. This can be important if sued or bankruptcy. 403(b) are retirement assets and protected from creditors, but IRAs are not. * 403(b) grandfather rules don't count early contributions in figuring minimum distribution, but in my case this would I suspect (at best) reduce the minimum distribution by something like 3 or 4%. Not worth worrying about. -- You can generally roll over tax free all or any part of a distribution from a 403(b) plan to a traditional IRA or a non-Roth eligible retirement plan, except for any nonqualifying distributions, described below. ** -- Direct rollovers of 403(b) plan distributions. You have the option of having your 403(b) plan make the rollover directly to a traditional IRA, Roth IRA, or new plan. Before you receive a distribution, your plan will give you information on this. It is generally to your advantage to choose this option because your plan will not withhold tax on the distribution if you choose it. The general rule for multiple shielded accounts is this: For MDR purposes multiple IRA's can be combined, and multiple 403(b) can be combined, but you can't combine IRAs and 403(b) accounts. You must withdraw the appropriate percentage from each type of account. * If you have multiple Traditional IRAs, you may calculate each IRA's RMD, combine these RMDs, and withdraw the total amount from one Traditional IRA. * If you have multiple 403(b) accounts, you may calculate each 403(b)'s RMD, combine all these RMD amounts, and withdraw the total amount from one 403(b). * If you have multiple inherited/beneficiary IRAs from the same decedent, you may choose to combine life-expectancy distributions for those inherited IRAs and withdraw the total from one inherited IRA. * You may not combine RMD amounts for different types of plans. For instance, an RMD amount for a 403(b) account may not be withdrawn from a Traditional IRA or vice versa, and the RMD for a 403(b) account may not be withdrawn from a qualified plan. * You may not combine the RMDs for multiple qualified plans. Each RMD must be withdrawn from the respective qualified plan. * RMD amounts for inherited/beneficiary IRAs may not be withdrawn from Traditional IRAs that you own. Hence another advantage (besides more investment choices) to converting a 403(b) account to a (standard) IRA is that there is more flexibility in preventing the annual MDR from messing up investment allocation and risks. With everything in IRAs you have maximum freedom to choose which investments to sell (and which to hold) to meet the annual MDR. * No carryover in calculating MDR. MDR is an annual withdrawal. If you withdraw too much, for example in closing out an investment position, the extra is wasted! values on Dec 31, 2011. This either means finding this value on financial web site or making some telephone calls. * IRS tables lists the MDR withdrawal multiplier as an age. This is really stupid! You need to invert the age to find the amount you need to withdraw each year. to withdraw, this is the information people need to do a MDR. 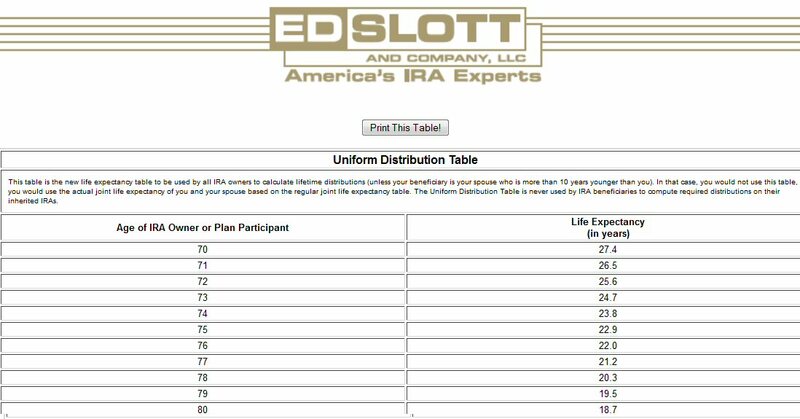 Below is the 2012 IRA IRS MDR table (captured from the Ed Slott web site). IRA minimum distributions start off at 3.65% at age 70 and in the next years the % rises to 3.77, 3.91, 4.05, 4.20, 4.37 (age 75). In other words once you start IRA distributions the dollar amount you need to withdraw (for a fixed investment value) rises about 3 to 4 percent each year as you age. -- "One of the primary benefits of designating a charity as your IRA beneficiary is that your assets are not taxed as they pass to your beneficiary upon death. If you had designated an individual as your beneficiary, that person would be subject to ordinary income tax on any withdrawals from the IRA, which generally must begin immediately upon transfer. Unlike in regular taxable investment accounts, assets in an IRA do not "step-up" in basis. Rather, the entire amount of a traditional IRA is fully taxable at ordinary income tax rates. If you have a $1 million IRA, passing those assets to a charity rather than an individual could save hundreds of thousands of dollars in assets. Although the assets in your IRA will technically remain as a part of your taxable estate even if your beneficiary is a charity, your estate will be entitled to a charitable deduction in the amount of the donation. The net of this is that your estate will not be liable for estate taxes on the amount of your IRA designated as a charitable contribution." -- When the IRA is left to a charity, the estate may take a deduction against the entire estate value for the amount of the IRA, thus reducing the estate transfer tax burden. -- "Instead of gifting your retirement assets to a charity during your lifetime, you may designate the charity as the beneficiary of your retirement account. Under this option, the charity - not you - will be treated as receiving the distribution; therefore, neither you nor your estate will owe income taxes on the amount. While the amount will be included in your taxable estate, your estate will receive a deduction for the amount inherited by the charity, resulting in an offset of the estate taxes. Furthermore, because charities do not pay income taxes on the donations they receive, the distribution will avoid being taxed as income." Buffet's charity plan, influenced by Bill Gates, is to give away 99% of his (remaining) wealth to charity (an unknown amount having already gone to his children and he says they get more to come at his death). The article below implies that nearly all his wealth is in shares of Berkshire Hathaway (his company), because what he is giving away is those shares. He wants none of the money to go to endowments, it's all to be used for current expenditures. The rate is interesting. In 2010 at age 80 Buffett says 20% of shares (counting also his late wife's shares) have been given away, and his plan is to give away an additional 4%/year ("4% of the shares I retain" whatever that means). Pretty slow rate for someone targeting 99%, since even at age 90 he will have given away 60% and retains 40% of his shares. He says the giving can go on for (up to) ten years after his death, which implies about the same distribution rate if he dies age 90 or older, but a somewhat faster rate if he dies younger (8% at age 80, 6% at age 85). I can think of several reasons for a slow rate. One, is that the amount of money is so large, that only so much cash can effectively be used per year. Second, is that the charity rate may be related to his income (Berkshire dividends) so he can use most it as a charitable deduction. Third, you have maximum influence with charity if they expect money from you ever year (though Buffet seems little uninterested in this aspect). 6% seems very low, since at modest incomes charity dedutction can be (approx) 1/3rd of income (do charitable deductions phase out at high income? Quick search seemed to say no). 2012 grand bargin talks have floated limiting charity deductions to 28% of income. One article seems to imply this is incremental. In other words if you are in the 33% income tax rate now, the money given to charity is (in effect) not taxed, since charity deductions (up to a maxiumum) are substracted off taxable income dollar for dollar (ignoring the complications of standard deductions). If a 28% cap was to be put into place, a 33% incremental tax payer could no longer reduce the tax on his charity giving to zero, but he could reduce it by 85%. With a 28% cap he would be taxed on 15% [= 5/33 = (33-28)/33] of the money he gives to charity. A good age to get serious about charity contributions is age 71. The main reason is that after age 70 1/2 you must begin withdrawals from your IRA and 403(b) accounts. This money (even if reinvested) is treated as earned income (same as W2 and pension income), so your income is going to go up, way up if you have a large amount of money in shielded accounts. With higher income a bigger charitable deduction makes sense, it's a natural fit. Charity deductions for appreciated securities (to donor advised charities) are limited to 30% of AGI, but an additional 20% of AGI in cash can be deducted too since the total charity limit is 50% AGI. If you have not been giving much to charity previously, you may find that a big charity donation can eliminate much of the added income tax from the IRA withdrawals. With a much higher income, you can effectively make use of a large charity deduction. If you take advantage of the 30% AGI limit for funding a donor advised charity with (highly) appreciated securities, you have a double tax advantage, more money to charity, less to Uncle Sam. Some numbers: Starting at age 70 1/2 you need to withdraw 3-4% of the value of your shielded accounts each year. Let's assume you have 2-3 million shielded, so annual withdrawals are about 100k. If you add this withdrawal 'income' to [SS + pension income + div and cap gains], you might end up with an AGI of say 160k. This will allow you to effectively use a charity deduction of up to 80k (= .50 x 160k) of which 48k (= .30 x 160k) can be in the form appreciated securities. If previously you haven't been giving much to charity, 80k in charity gifts can effectively eliminate about 80% of the increase in income tax that you otherwise would have to pay. If you are in the 28% incremental tax bracket, this saves you in taxes 22.4k ( = .28 x 80k), which is more than 25% of your charity gift, and this doesn't include the additional tax saving you get by giving to charity with appreciated securities. A word on state income tax and charity. I can only speak to my home state (MA), which doesn't provide for any charity deductions from income, so the above charity deduction doesn't reduce MA income taxes at all. However, the 2nd tax advantage of funding charities with (highly) appreciated securities does work for states. The reason is that the securities that are given (technically 'transferred') to charities are never sold by the donor (the securities later get sold by the charity, but charities pay no taxes). If no sale, then no fed OR state capital gains tax is triggered, which in MA is 5.3% saved in addition to the 15% fed (cap gains) savings. This fed + MA cap gain avoidance tax savings can be up to 9.74k (= .203 x .48k). So bottom line: an 80k charity gift (if done right) can yield a reduction in taxes of about 32k (= 22.4k + 9.74k), which is 40% of the gift. One convenient way to access charity financials for those with a donor advised charity account at Fidelity is via the 'Fidelity Charitable' web site. Its list of 501(3)(c) charities normally includes a financial summary and a link to the IRS filing. 'The Giving Common' is based in Boston. This site has a large index to local charities, which often link to their financials.